Fireflies entertain us with their flickers of light during warm summer evenings. These cute little bugs who fill the childhoods of many with their flickering entertainment are actually related to beetles. Each firefly flickers its light in a very specific pattern. These mostly nocturnal insects begin their lives as larvae on the ground, where they will feed off bugs and worms before developing into brilliant insects that light up the night sky. 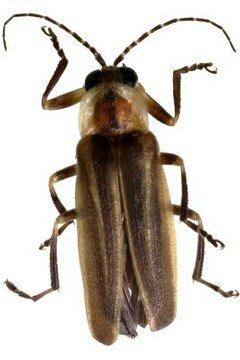 Most species of fireflies light up at night, but some species are nonluminescent. They use pheromones to find and attract mates. Luminescent fireflies light up to attract a mate of the same species of firefly. Luminescent fireflies are able to easily recognize their own species and whether they are male or female by the specific flash pattern. Mating usually takes place in springtime, at which point the female's eggs become fertilized. After the female's eggs have been fertilized during mating, she will lay her eggs on the ground. Sometimes she will lay them a bit below the ground's surface. In three to four weeks, tiny firefly larvae will hatch. They will stay on the ground and feast on earthworms, snails and smaller insects. This stage will usually last until the end of summer. During the cold winters, larvae and fireflies will shield themselves from the cold by either burrowing under the ground or tucking themselves away in between crevices of tree bark. Once winter has run its course, they will emerge in the warm spring air. By this point, the larvae are usually full-grown adults and ready to take on the world, but not until they feed in the pupae stage for around two and a half weeks. For many species of fireflies, their flickering light is what attracts potential mates. This stage of flickering light will only last for around three to four weeks. During this stage of light production, called bioluminescence, the main goal is to mate and reproduce. Sometimes after this stage, some fireflies will lose their ability to light up. Other will retain their ability and use it to ward off predators or attract prey. The flickering light warns potential predators that the firefly won't be an appetizing meal. Many fireflies live for up to two months long.